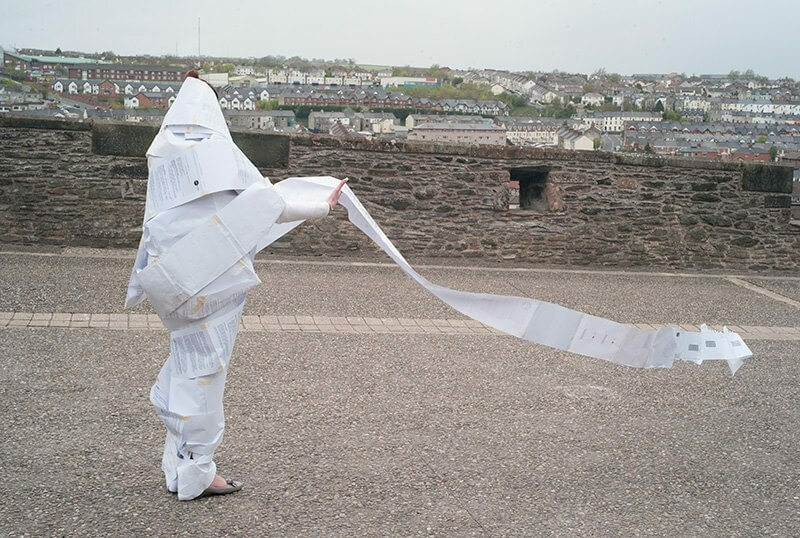 “…paper is the materialised energy of itoshiroshi, that extreme form of purity that is ladled out of chaos and which appears to us both potentially and actually.” Kenya Hara. Since 1999 I have been working with the idea of paper. Paper has memory, it is a medium, a document a catalyst, a message, a creative act, it transforms, it travels, it is solid in a semi transparent world, it holds value, it proves, it allows us to share information and ideas, it sorts us into groups of accepted and rejected, it covers up temporarily, it is recycled, it is domestic, it is bureaucracy, it is white, it is empty, it is where I go to make. Making Art changes things, even if this is only for a fleeting moment. Great art can transform and create a new understanding, through dialectics; turning confusion, loss, fear and injustice into something that moves emotionally and physically. I’m driven to contribute to this legacy. I refer to my current works as Performative Occupations. This is the way I can most accurately and efficiently describe the situation and space and the action within; occupying space and time performing a task.